Microsoft Excel offers the creation and management of tables with hundreds of functions carried out by sophisticated calculations and analysis. Using conditional formatting,charts visualizing the data obtained. For larger amount of data enables using pivot tables and PowerPivot tools to compare the data in context and summary results displayed to the user. Let ITLektor show you the mysteries of this powerful application. (Čeština) Online kurz Excel makra VBA – základy programování Sorry, this entry is only available in Czech. (Čeština) Online kurz Excel – grafy Sorry, this entry is only available in Czech. 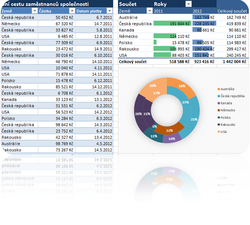 (Čeština) Online kurz Excel – Pro experty Sorry, this entry is only available in Czech. (Čeština) Online kurz Excel – Microsoft Query Sorry, this entry is only available in Czech. (Čeština) E-learning Excel – Pro pokročilé Sorry, this entry is only available in Czech. (Čeština) E-learning Excel – Pro středně pokročilé Sorry, this entry is only available in Czech. (Čeština) E-learning Excel – Podmíněné nástroje a funkce Sorry, this entry is only available in Czech. (Čeština) E-learning Excel – Velké tabulky Sorry, this entry is only available in Czech. (Čeština) E-learning Excel – Formátování tabulek Sorry, this entry is only available in Czech.